One of the paradigm shifts on the future scenarios curve is healthy life extension. When I mention to an audience that the first person to live to 200 has already been born – it gets quite the reaction. Extending our healthy lives has many implications to very long held beliefs. These challenges to our belief systems are the reason I believe humanity is heading towards another Tipping Point – that moment in time where intuitions and beliefs built over long periods experience a considerable shift. It is the reason I titled my presentation “A Journey through the Looking Glass”. Through the looking glass is a metaphorical expression. It means: on the strange side, in the twilight zone, in a strange parallel world. It comes from the idea of Lewis Carol’s novel: “Through the Looking–Glass“, and the strange and mysterious world Alice finds when she steps through a mirror. I firmly believe we are stepping through the looking glass. Healthy life extension is a great example of a scenario on the curve upending long standing institutions. As visualized below, multiple building blocks converge to deliver this scenario. In his seventh post in the series, Marshall Kirkpatrick focuses on the intersection between artificial intelligence and genomics. 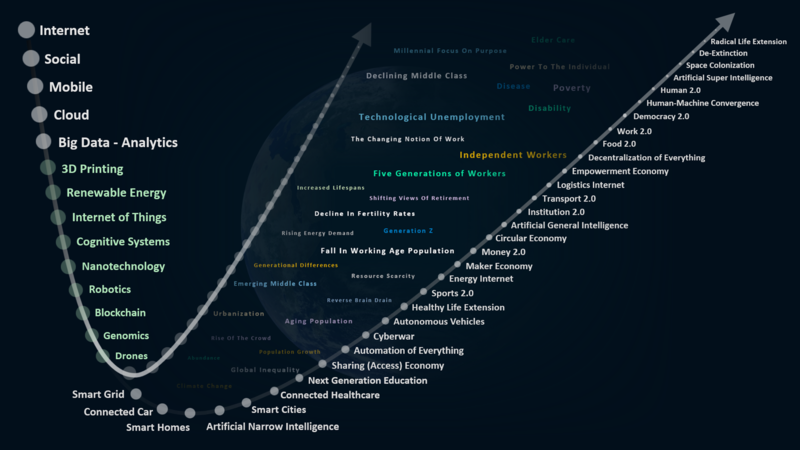 By way of reminder, Marshall launched a 30 day series that explores the intersection between AI and the various innovation components on my emerging futures visual. I’m wrapping up another book titled The Industries of the Future. 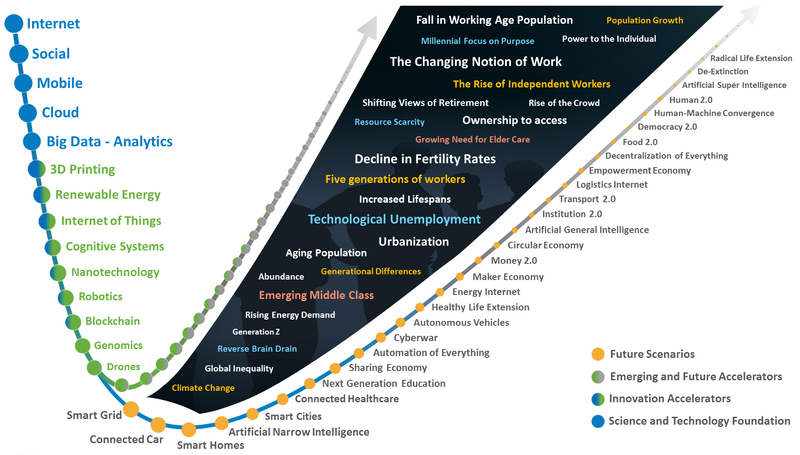 Author Alec Ross explains the advances and stumbling blocks that emerge in the next ten years, and describes a way to navigate them. He is one of America’s leading experts on innovation, serving four years as Senior Advisor for Innovation to Secretary of State Hillary Clinton. Mr. Ross is currently a Distinguished Visiting Fellow at Johns Hopkins University. His book identified three future scenarios that I have added to the visual below. These scenarios are Cyberwar, Precision Agriculture, and De-Extinction.